LINCOLN, Neb. 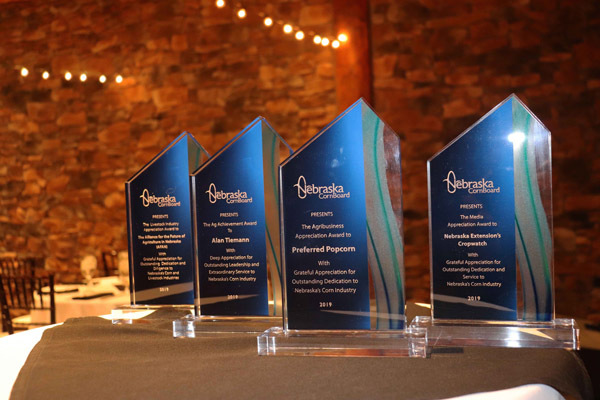 – Five recognition awards were presented to individual, educational and industry leaders at the Nebraska Corn Board’s 2019 awards dinner held March 28 in Lincoln. 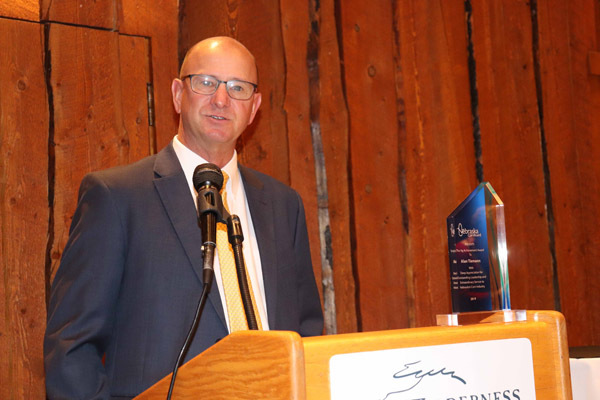 The annual awards highlight outstanding contributions to the state’s livestock, ethanol and agribusiness sectors, as well as an exceptional ag media source. The dinner was capped off with the presentation of the board’s most prestigious award, the Ag Achievement Award. 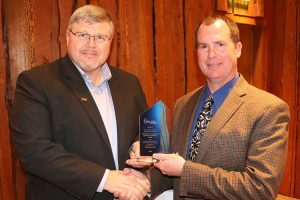 This year’s Ag Achievement Award was presented to Alan Tiemann, a corn and soybean farmer from Seward. Tiemann has a proven track record of exceptional leadership in the agricultural industry. He served on the Nebraska Grain Sorghum Board from 1997 to 2003 and the Nebraska Corn Board from 2005 through 2018. On the national stage, Tiemann has been active in the U.S. Grains Council (USGC), which exists to develop export markets for U.S. corn, barley, sorghum and related products, including distillers dried grains with solubles (DDGS) and ethanol. On the USGC, he served as a delegate from Nebraska, was a member of the board of directors for six years, was elected secretary/treasurer in 2013 and chairman in 2015. He currently serves on the USGC’s credentials committee as past chairman. The Ethanol Industry Appreciation Award was presented to Siouxland Ethanol out of Jackson. 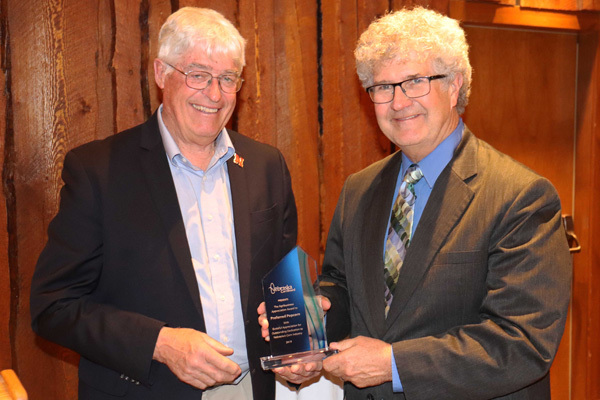 The ethanol plant was recognized for their dedication to producing a quality, clean-burning renewable fuel, which builds corn demand while also supporting other industries, such as the livestock sector. 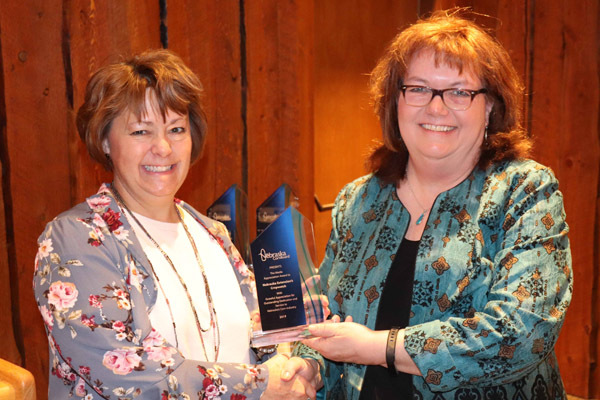 Because Siouxland Ethanol was also hosting their annual meeting in South Sioux City on March 28, the award was accepted remotely by Pam Miller, chairwoman of the Siouxland Ethanol board. Dave Merrell, District 7 Director of the Nebraska Corn Board, presents the Livestock Appreciation Award to Steve Martin, executive director of AFAN. This year’s Livestock Industry Appreciation Award was presented to the Alliance for the Future of Agriculture in Nebraska (AFAN). Since its formation in 2005, AFAN has been an important advocate for livestock production in the state. Throughout its existence, AFAN has promoted, supported and grown the livestock industry in Nebraska, which has greatly benefitted the state’s corn industry. Debbie Borg, District 4 Director of the Nebraska Corn Board, presents Lisa Jasa, editor of UNL’s CropWatch, with the Media Appreciation Award. CropWatch.unl.edu was the recipient of the Media Appreciation Award. CropWatch is a website that provides farmers and ranchers with up-to-date information on a variety of agricultural topics throughout the year. The website is produced by the University of Nebraska-Lincoln’s Institute of Agriculture and Natural Resources. The Nebraska Agribusiness Appreciation Award was given to Preferred Popcorn. This Chapman-based agribusiness was founded in 1997 by four local farmers. Since that time, the company has grown and now works with more than 50 farmers across the Midwest to grow and process over a billion servings of premium organic and conventional popcorn each year. John Greer, District 2 Director of the Nebraska Corn Board, presents the Nebraska Agribusiness Appreciation Award to Norm Krug, founder of Preferred Popcorn. 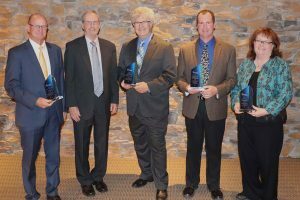 Each award winner was identified and selected by the Nebraska Corn Board. 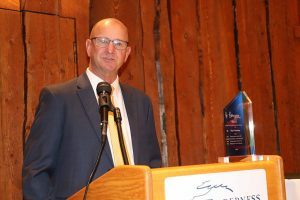 The Nebraska Corn Board’s annual awards night was held March 28, 2019 in Lincoln. 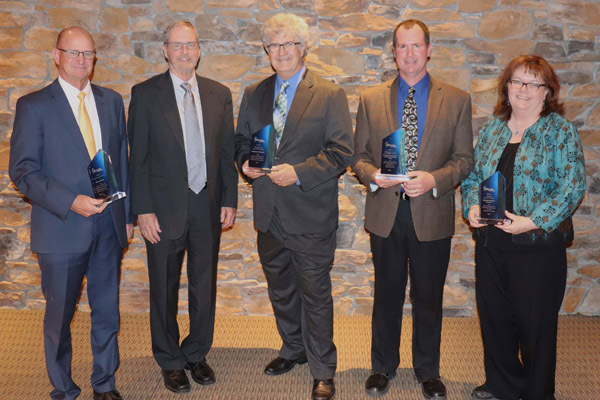 Editor’s Note: Additional photos of the 2019 award recipients are available online by clicking here.